In my review of the first season of The Simpsons, I mentioned that “Life on the Fast Lane,” was the season’s only episode that contended for a spot in the series’ pantheon. In “Simpsons Classics,” I’ll do my best to explain why “Life on the Fast Lane” and episodes like it belong in said pantheon. The first great episode of The Simpsons, “Life on the Fast Lane” deals with Marge’s temptation to cheat on Homer with Jacques, a French bowler impeccably voiced by Albert Brooks. Most Simpsons episodes that consider extramarital temptation in later years do so from Homer’s perspective. Homer is wooed by country star Lurleen Lumpkin, has trouble resisting coworker Mindy Simmons, and even gets married to a second woman in Las Vegas. Each of these episodes places moral culpability on Homer; in other words, it’s never anything Marge does that leaves Homer vulnerable to outside affairs. “Life on the Fast Lane” is very different. Marge is driven away from her husband by Homer’s own selfishness, illustrated first by his forgetting her birthday (thinking momentarily that it was his own) and then presenting her with a bowling ball—with “Homer” engraved on it—as her present. This reprehensible act of husbandry isn’t even isolated; as Patty/Selma detail earlier in the episode, Homer’s past birthday gifts to Marge include a tackle box and a Connie Chung calendar. It’s easy, then, to sympathize with Marge’s view that perhaps destiny has brought her to Barney’s Bowl-A-Rama, where she meets Jacques. Jacques is more attractive than Homer, he is wittier than Homer, and he is more caring than Homer; he is obviously an upgrade. The second time he meets Marge, he presents her with a bowling glove: “You got it in my size, and it has my name on it; it’s really for me!” Marge responds. Indeed, getting a gift all her own seems a first for Marge. *You can make a case for Hank Scorpio, but I’d stick with Jacques for two reasons: 1. He’s not a clear parody of a Bond villain; 2. Brooks’ voice for Jacques is unique, and he doesn’t use it again and again for various characters as he does with Scorpio’s (which is the same as the voice for Russ Cargill in The Simpsons Movie, among others). This is all to say that BOTH Marge’s attraction to Jacques and her considerations of leaving Homer are justified in the episode. That’s different from Homer’s temptations, where although we could understand why he wanted to be with Lurleen/Mindy,* it’s hard for him to justify leaving Marge. 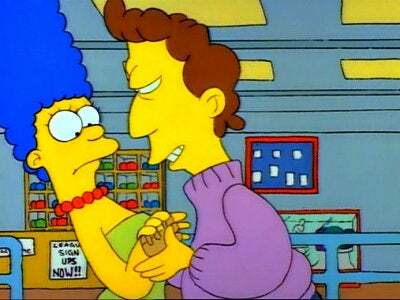 I mean, the worst thing Marge does in “The Last Temptation of Homer” is get a cold. The way these episodes operate also speaks to the implicit assumption all viewers of The Simpsons have: that Homer is lucky to be with Marge, and not vice versa. “Life on the Fast Lane” helps cement that perception in the series’ first season. *And especially Mindy. She’s the ideal woman. While Jacques attempts to woo Marge, we see the effect her absence has on her family’s home life. She herself overcompensates by offering the kids oversized lunches, Lisa and Bart endure various stages of grief, and Homer is completely resigned to losing his wife (best shown when he glumly puts away the glove Jacques gave her—he won’t be the one to bring it up—and by his game of “catch” with Bart, when he doesn’t even say “Ow” as a baseball at full speed hits him in the head). Throw in the fact that Marge contemplates the affair right after her birthday—a time of increased introspection for a woman—and “Life on the Fast Lane” possesses a tone of distinct realism, where almost all of the characters’ actions are both in character and understandable. Yeah, I consider The Simpsons canon as nothing really past the 12th season, so I don’t really “count” those later episodes. I remember one where Homer thought Marge was cheating with Kirk Van Houten; I mean, come ON. See the impression I got is that Marge confused “mimosa” for a sexual act, not a pet name. Rather like a similar gag in Frasier where Niles and Daphne ask if Roz will “join them in a melange” (of fruit) and she quite rightly thinks they mean a ménage.